THE Mighty Titans of Bowerhill, who ran 1,000 miles from Land’s End to John o’Groats in just over six days in the summer, have donated £20,000 to Wiltshire Mind. The total amount raised smashes their original target of £10,000. Sixteen runners took part in the epic charity challenge, which was the fourth challenge event organised by the fitness enthusiasts. who all train at New Era Fitness in Bowerhill. 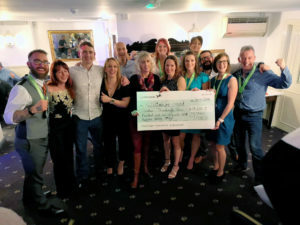 The group recently held an event to celebrate their 1,000 mile run and to hand over the cheque to Wiltshire Mind – the Melksham-based mental health charity which offers support across Wiltshire. Group leader and owner of New Era Fitness, DJ Hussey said, “We officially announced that we raised exactly £20,000 for the charity – which we are all totally blown away with, as at times, we worried that we wouldn’t even make our original £10,000 target. So to double it is overwhelming! The amount raised brings the group’s overall total raised from their four charity challenges to £32,500. Previous challenges include cycling from London to Paris last year in the space of three days. Above: The Mighty Titans present their cheque to Carolyn Beale from Wiltshire Mind.